Looking for a way to make their entire home and other elements of their lives more eco-friendly. Shopping for bedding made from natural elements is currently a popular trend, and for good reason. People spend quite a bit of time in their beds, and many rest better knowing that they’re being environmentally conscious, and not spending their nights exposed to potentially harmful chemicals. A lot of bed linens on the market are made from synthetic, nonrenewable materials. Some of these may include polyester, nylon, and spandex. These materials are man-made and created with various chemicals. Some people are sensitive to these chemicals as well as the dyes that may also be used. Choosing natural organic materials is safer since they are not treated with harmful chemicals while being processed. They’re also a more environmentally friendly option since they’re made with renewable fibers. These materials include cotton, wool, and silk. There are eco-friendly versions of the various pieces that complete a set of bed linens. For sheets, pillow cases, and duvet covers, look for the standard natural fabrics like cotton, wool, and silk. Or, there are also alternative materials such as bamboo, hemp, and wood pulp. Pillows and comforters are also safer and more environmentally conscious if they are made with natural fillings like cotton, down, wool, or milkweed. Many of these eco-friendly choices are very affordable, and can positively affect consumers’ health and the environment. 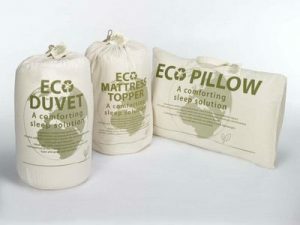 Purchasing environmentally conscious bedding is a great way to keep yourself and your loved ones safer. Bio: Stephanie Lichtenstein Ramos offers style tips on behalf of BeddingStyle, the Web’s destination for luxury bedding from well-known designers.